Click on the .pdf for the latest brochure! 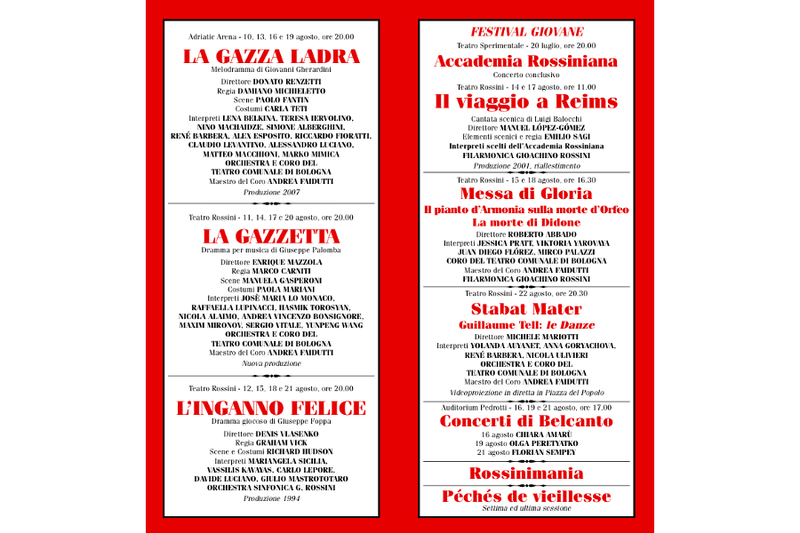 Soloists: Lena Belkina, Teresa Iervolino, Nino Machaidze, Simone Alberghini, René Barbera, Alex Esposito, Riccardo Fioratti, Claudio Levantino, Alessandro Luciano, Matteo Macchioni, and Marco Mimica. Donato Renzetti conducts The Orchestra and Chorus of the Teatro Comunale di Bologna ; Andrea Faidutti, chorus master. The production is a revival from 2007 by Damiano Michieletto. Soloists: Josè Maria Lo Monaco, Raffaella Lupinacci, Hasmik Torosyan, Nicola Alaimo, Andrea Vincenzo Bonsignore, Maxim Mironov, Sertio Vitale, and Yupeng Wang. Enrique Mazzola conducts The Orchestra and Chorus of the Teatro Comuale di Bologna; Andrea Faidutti, chorus master. Solosits:Mariangela Sicilia, Vassilis Kavayas, Caro Lepore, Davide Luciano, and Giulio Mastrototaro. Performances are August 12, 15,18, and 21. Soloists: Jessica Pratt, Viktoria Yarovaya, Juan Diego Flórez, and Mirco Palazzi. Michele Mariotti conducts the Orchestra and Chorus of the Teatro Communale di Bologna: w Andrea Faidutti, chorus master.